Solar panels at Ohio State University’s Stone Laboratory on Gibraltar Island. Opposing the project are the Office of the Ohio Consumers’ Counsel, the Ohio Coal Association, the Ohio Manufacturers Association Energy Group, and other large electricity customer groups and competitors. If the Public Utilities Commission of Ohio agrees, AEP’s Ohio utility plans to charge utility customers for construction and operation costs of the project. As a general rule, electricity generation and distribution in Ohio are separate, with distribution being a regulated monopoly and generation subject to customer choice. However, Ohio law allows an exception if, among other things, the Public Utilities Commission determines there’s a “need for the facility based on resource planning projections” from the utility. AEP and the project’s supporters say the evidence will show ample need for the facility, for Ohio generally and especially for Appalachian Ohio. 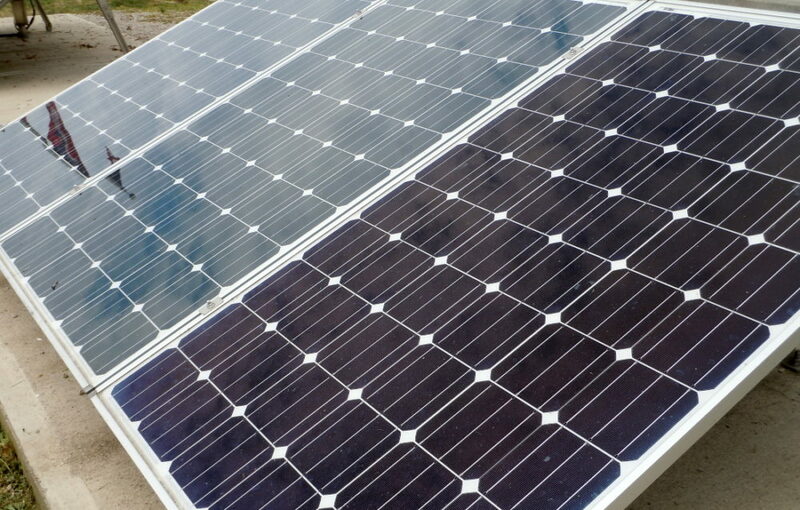 “These renewable projects position Ohio well for any future environmental safeguards related to carbon pollution and bring much needed jobs to Appalachia, an area that has steadily lost jobs tied to the coal industry,” said project director Evan Blumer of the Appalachian Ohio Solar Jobs Network. The addition of a large amount of renewable energy generation would also help attract large companies who want their electricity to come from clean energy, said Dan Sawmiller, Ohio energy policy director for the Natural Resources Defense Council. Also as coal’s share of the electricity market has declined, it has been replaced more and more by natural gas. The proposed project “can help reduce the volatility of that market exposure” by leveling out rates over time, Sawmiller said. Then there’s the matter of money. AEP’s forecasts show that customers will save more than $200 million over a 20-year time period. Based on NRDC calculations, Sawmiller said those benefits were “conservatively estimated.” And that still wouldn’t count either the project’s benefits for reducing greenhouse gas emissions in order to rein in and improve resilience to climate change, he said. Nor would it include health benefits from reductions in other pollutants that lead to more cases of asthma and other disease. In contrast, opponents want the commission to interpret “need” very narrowly. They note that when all types of electricity generation are considered for the PJM region, there is sufficient generation capacity. Nor are challengers swayed by the fact that the proposed project is for renewable energy. “Renewable energy is a good thing and Ohio’s competitive market is already providing Ohioans with lots of choices for renewable power without subsidies,” said J.P. Blackwood, spokesperson for the Office of the Ohio Consumers’ Counsel. The Ohio Consumers’ Counsel Governing Board passed a formal resolution opposing AEP’s proposal on Jan. 15, the same day that the hearing started. PUCO staff member Timothy Benedict likewise took a very limited approach to the question of need. “Having determined that supply is sufficient to meet the needs of Ohio Power’s customers…, Staff therefore finds that the Company has not demonstrated a need to construct any additional resources at this time,” Benedict said in a Jan. 8 filing recommending against the project. The Ohio Coal Association, an intervenor in the case, echoed the anti-subsidy sentiment, even though the initial proposal for the AEP solar project grew out of a partial settlement in a case to allow subsidies for two 1950s-era coal plants. Current expectations are that the hearing in the case will run through at least Jan. 25, with parties having an opportunity to submit briefs afterward. It’s unclear how soon after that the commission will rule on the issue of need for the project. “The opportunity that this project presents in Appalachia cannot be ignored,” said Sawmiller. “That’s just a critical thing.” In his view, there’s a very real need for jobs and economic development in that part of Ohio. Likewise, he, AEP and other supporters want the Commission to consider all the other factors that they say show a need for the project.